If did not have your own domain, then you could leave the domain part blank, have your username be *.gmail.com, and the web space would be the name of the site when you created it. As a refresher, you did this under sites(1) and then created a new site(2). 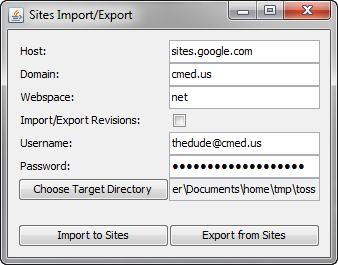 The Target Directory is where to either grab contents to Import, or where to put files that were Exported.